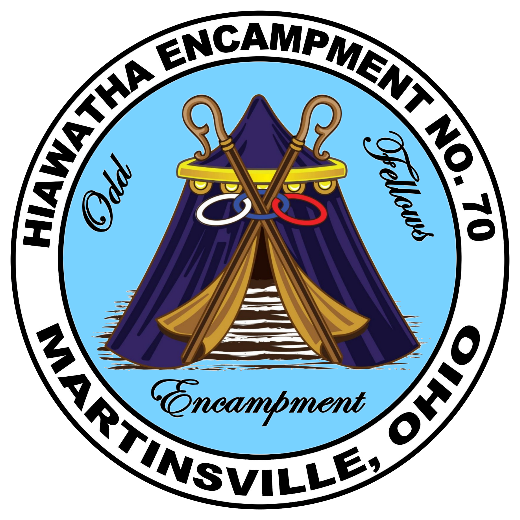 Welcome to the webpage of the Hiawatha Encampment No. 70, IOOF (Independent Order of Odd Fellows), of Martinsville, Ohio, which was instituted on January 16, 1854. We are a Non-Profit Fraternity Organization. The Encampment is an appendant body in the IOOF and is open to third degree members in good standing. This branch is based on the principles of Faith, Hope and Charity. One must go through the Encampment first before seeking entrance into the Patriarchs Militant, which is a uniformed appendant body to the IOOF. Once one has accomplished the Royal Purple degree of the Encampment, one is eligible to hold an officer position in the Encampment and is also eligible for the Patriarchs Militant. The initials of the Encampment are FHC which stands for Faith, Hope and Charity. The Encampment's seal is a purple tent with golden trim, the triple links above the tent door and crossed shepherds crooks. These symbols can be seen on the purple fez that American members of this branch wear. One must retain their membership and remain in good standing within their own subordinate lodge while in the Encampment. Patriarch – Aims to teach the lessons of transparent honesty, domestic purity, genuine hospitality and unfeigned righteousness. Golden Rule – Aims to teach good will, tolerance, and true brotherhood. It also teaches that members should unite with the virtuous and good irrespective of country, religion, or politics in the discharge of duties which all agree are paramount to universal peace and cooperation. Royal Purple – Aims to teach alertness and determination as basis for a possible success in the journey called life.